A shocking chart released by MetDesk predicts that by this Sunday much of the country could be white once again. The south of England is depicted as having around a 30 percent chance of widespread snowfall, but in the north this figure rises astronomically to 60 percent or above. 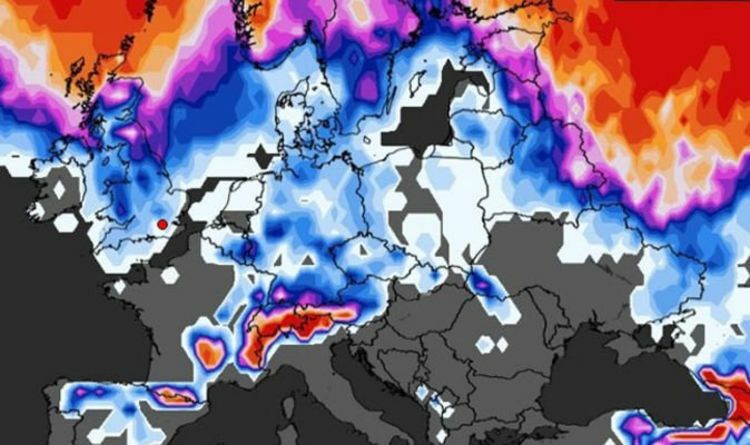 Much of Scotland will almost inevitably see snow as the likelihood shoots to around 80 percent. But first, a deep band of low pressure will sweep across Britain bringing “severe gales” and disrupting “large parts of the UK”, the Met Office has said. Gusts will strengthen as they spread across Britain over the next 24 hours impacting drivers, flights, train and ferry services. There are two remaining yellow weather warnings - for wind and rain - in place after the turbulent weather swooped in last night. A yellow weather warning for wind runs from 12pm on Friday until 6pm on Saturday for the majority of England, Wales, Scotland and Northern Ireland. The warning reads: “Whilst some places may miss the worst of the winds, inland gusts of 50 mph are expected quite widely, with some places having gusts in excess of 60 mph, more especially across the north of the warning area on Saturday. “Gusts of up to 70 mph are likely around some coasts exposed to the west or southwest.